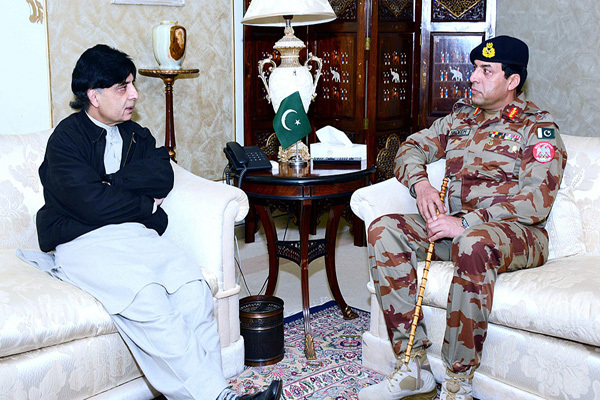 ISLAMABAD, Jan 25 (APP): Minister for Interior Chaudhry Nisar Ali Khan here on Wednesday held a meeting with Inspector General Frontier Corps Major General Nadeem Ahmed Anjum and discussed matters relating to peace and security in Balochistan. The Interior Minister congratulated Major General Nadeem Ahmed Anjum on his appointment as IG FC Balochistan. They also exchanged views on affairs of Frontier Corps and the minister assured that all needs of FC would be met so that it could properly fulfil its responsibilities. The minister said FC had a vital role in restoration of writ of state in Balochistan and for peace and security in the province. He said besides removing anti-Pakistan forces from the province, FC has a responsibility to win hearts and minds of people of Balochistan. He said the enemy wanted to use the land of Balochistan for its last war. The enemy was unsuccessful last time and this time too it would fail, he said adding it was mutual responsibility of all to not only keep peace at China Pakistan Economic Corridor (CPEC) but also in the whole of Balochistan. He welcomed that in the last few weeks, a large number of people in Balochistan were shunning the path of violence and becoming part of the national mainstream.